The M2 Half Track Car was initially conceived as an artillery tractor, with enough space only for the gun crew. Thus, the M3 was created in late 1940, with a longer body, in order to accommodate a full platoon of thirteen riflemen and their equipment. The access was performed through the back door, and the galley part of the hull didn’t incorporate an ammunition hold. It was simplified for mass production, but the wheelbase and other general characteristics remained unchanged. The M3 was produced by the Autocar Company, Diamond T Motor Company and the White Company until the end of the war. It was, at first, fitted with the reliable White 160 Ax 386 cu in (3660 cc) engine, a gasoline six-cylinder with a compression ratio of 6:3:1 and a power to weight ratio of 15.8 hp/ton. But a more powerful array of IHC engines became available, and many later versions were remotorized until the end of the war. M3 Half Track, Thunder over Michigan, 2006. It had a pintle gun mount for a cal.50 (12.7 mm) M2 heavy machine gun, and two other pintle mounts on the inner hull sides. This early arrangement was replaced by the “pulpit mount” M49 for the cal.50 (12.7 mm), as well an extra aerial pintle mount for a third cal.30 (7.62 mm). The vehicles thus armed were named M3A1. Many complaints rose about the lack of protection offered by the armored panels, as these half-tracks were infamously dubbed “Purple Heart Boxes” (this decoration was offered to all servicemen wounded or killed, often posthumously). It was apparent that machine gun fire could pierce its armor, and the lack of roof protection was critical in the face of shrapnel and air-burst shells. Over 41,000 M3s were built, plus 2000 M5s produced by International Harverster Co for Lend-Lease, with an IHC RED 450B engine, modified drive train, electrical and fuel systems. Like the M2, the M3 was adapted for many purposes. Besides the regular M3 and M3A1, and the late (never produced) M3A2, there was a specific variants for Lend-Lease. The M5 was provided to Great Britain, USSR, Canada and France, with the M5A1 sub-version differing by some equipment, fittings (inspired by the M2), radio access and rear doors. All were regular troop transports. The two main specific variants of the war were gun carriers and anti-aircraft models. The self-propelled guns variants were the T12, M3 and M3A1 GMC, equipped with the M1897 A5 75 mm (2.95 in) gun and its gun carriage, with a special-purpose shield in later versions. This gun stock was exhausted and new variants appeared, the T73 GMC equipped with an M3 75 mm (2..95 in) gun, but never entered production, and the T19 HMC armed with a 105 mm (4.13 in) howitzer for the USMC. The T30 HMC was another variant, equipped with the M1A1 Pack Howitzer. The T48 GMC was built for the US army, equipped with the 57 mm (2.24 in) M1 gun, an US adaptation of the British QF 6-pounder antitank gun. There was also a mortar version called the T19 MMC, equipped with the 81 mm (3.19 in), also known as the M21 MMC. Anti-aircraft versions were also highly successful, developed upon the M2 special versions and experiments. The M13 MGMC was the first one, with the M14 sub-version, fitted with a Maxson M33 double mount for two cal.50 (12.7 mm) M2HBs and 5000 rounds in store, with removable side panels. The M14 was based on the M5 chassis, for Lend-Lease, and was provided to Britain. The M16 MGMC was probably the best known and most prolific, with its new Maxson quadmount M45D, sporting four modified 50 caliber (12.7 mm) M2HB machine-guns. The M16A1 had fixed armored panels and the M16A2 had minor modifications and the M45F improved quadmount. The M17 was based on the M5, and exclusively provided to Soviet Union. The T28E1 was a special purpose version equipped with a single 37 mm (1.46 in) cannon M1A2, assisted by two cal.30 (7.62 mm) M2WC machine-guns. Its sub-versions, the M15 and M15A1, had minor modifications. There were also several prototypes fitted with the 40 mm (1.57 in) Bofors canon, but the recoil was so strong that only one was built. The Australian M15 “Special” was the only Bofors version successful enough to see mass conversions. All were used in the South Pacific. The M3 was adopted by the US Army and Marines, and was found in all theaters of war, North Africa, Europe and the Pacific. It proved reliable and versatile and was fielded by British and Commonwealth forces under Lend-Lease, as well as by many reconstructed Allied forces (Free French, Polish, etc.). The International Harvester Company made an additional 3500 M9s (an export version of the M2), from which 800 (along with some M2s) were allocated to the Soviet forces. At the end of the war, many surplus Lend-Lease models were sold to South American countries. Some retained their models, with many modifications, until 2009. In all, the M3 was known to have been used by twenty countries, including Czechoslovakia, Chile, France, Greece, Portugal, Brazil, Poland, Israel, Mexico, Nicaragua, Belgium, Netherlands, Cambodia, South Vietnam, Laos, Argentina, and Lebanon. Israel was given many half-tracks and greatly modified them, spanning the Mk.A to D, culminating with the TCM-20 armed variant, the last modified version. An M2A1 Half-track Car, for comparison. France, June 1944. M3 in Algeria, Operation Torch, November 1942. Early production M3 with canvas, Italy, 1944. A British M5 (the Lend-Lease version built by International Harvester) of the VIIIth Army, Tunisia, January 1943. A Free French M5A1 (late version modified alongside the M3A1), of the First Army, gen. De Lattre De Tassigny, Provence, Southern France, August 1944. Large amounts of M5s were provided to the French, which took part in operation Anvil Dragoon. This one is a pure transport vehicle, unarmed. Notice the FFF slogan – France First. T30 75 mm (2.95 in) HMC (Howitzer Motor Carriage), carrying the M1927 pack howitzer, Palermo, Sicily, 1944. Notice the American flag and yellow star, both inherited from Operation Torch. The big white star was meant for identification by Allied aircraft. The pale green scheme was usual to this theater of operations. The T12 was equipped with an M1897A4 75 mm (2.95 in) guns, an American version of the French famous “canon de 75”. This was the most common Gun Motor Carriage, intended primarily for infantry support role, although some were used occasionally against tanks with some success, and AT shells were provided to some first line units for this purpose. Over 2200 GMCs were built prior to April 1943, but only 842 seem to have seen service. The M1897 had an indirect fire range of 9,200 yds (8,400 m), and provision was 59 rounds, either AP M72 (Armor Piercing), APC M61 (Armor Piercing Capped) or the high-explosive anti-personnel HE M48. This illustration depicts a 1st US Army GMC stationed in Sicily, 1943. M3 75 mm (2.95 in) GMC in North Africa, US 1st Division, Tunisia, June 1943. The M3 GMC was the main Gun Motor Carriage derivative of the M3, equipped with a 75 mm (2.95 in) gun, mostly used by the USMC. The medium velocity of this gun made it unsuitable against most Panzers in 1943. Its AP projectiles were able to pierce only 7.1 to 8.1 mm of armor at 500 yds (460 m). Most of them were used for artillery support. GMCs were also used by the USMC in the Pacific theater, with better success against Japanese tanks. They saw action at Peleliu, Tarawa, Saipan and Okinawa, were they replaced tanks in the infantry support role. 75 mm (2.95 in) SP, Autocar, as it was designated in British service. 170 M3 GMCs were provided to the British army fighting in North Africa in early 1943. The Free French also used them in limited numbers. A T48 GMC in service with Patton’s army, Operation Cobra, Normandy, July 1944. A regular T19 Howitzer Motor Carriage, based on the M3 chassis, and equipped in a very similar fashion that the former 75 mm (2.95 in) HMC it replaced. With its long barrel and heavier high explosive shells, it was well suited to add firepower where it was needed. The T19 105 mm (4.13 in) HMC was not a high production vehicle, around 400 were operated in all. But the punishing fire of the howitzer, mounted in the most cost-effective solution yet, made a potent combination. This version was mostly used by the USMC in the Pacific, but also saw action on every front, from Tunisia to Germany. The M4 MMC was a new concept, entirely refurbished to operate a single regular ordinance 81 mm (3.19 in) mortar. It was accepted in service in October 1940 and 572 were built. Later on, the evolved version came, as the M4A1, which allowed the mortar to fire from the vehicle. It was put in production in December 1942 and 600 were built. They were respectively based on the M2 and M2A1, but then the Ordnance Department decided to exploit the M3 chassis, which became the M21 MMC. The mortar was now forward firing, with a reinforced basis which allowed wide angle fire. But, moreover, there was now a defensive cal.50 (12.7 mm) placed at the rear. Only 110 were built, in early 1944. The T21E1 was an experimental new version. It was superseded by a 107 mm (4.21 in) MMC version. The M13 (and the M14 subversion) MGMC were the first successful AA adaptations of the M3 Half Track, using the Maxson M33 twin mount. They had two M2HB cal.50 (12.7 mm) heavy machine guns, with very good results against low-flying aircraft. The side panels were foldable, to allow a better arc of fire. All the internal compartment was refurbished. They were accepted in January 1943, and 1103 half-tracks were built as M13s, and later, 628 converted into quad-mount M16s. The “quad-mount” or “quad 50” M16 MGMC version, is probably the best-known and most produced of these AA variants based on the M3. Based on a new M50 mounting, it had excellent capabilities against low-flying aircraft, and quickly gained the nicknames of “meat chopper” and “Krautmower”. This mount allowed fast moving, high rate of fire of the highly reliable 50 cal (12.7 mm) heavy machine guns, most of the time with the new side panels folded. It was accepted in service in May 1943 and no less than 2877 were built, plus 628 converted from M13 stocks, and 109 from twin 20 mm (0.79 in) GMCs. They served in Tunisia, Italy, France and Germany, but also in the Pacific. 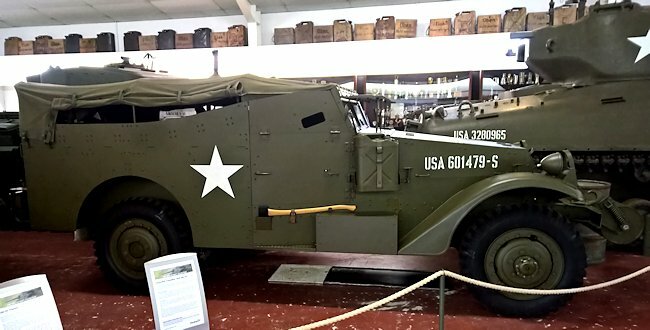 What was the roller for on the front bumper of the M3 Half Track? It is a scout car indeed. The legend was modified. Thanks for spotting it. HI. Loving you stuff but I noticed on this page no mention or picture of the M15 MGMC? I thought the M16 MGMC first saw action in Sicily and missed the Tunisian campaign. There is a brief mention of the M15 in the article. There is a high probability the M15 will get its own article at some point. I missed that bit! An article on the M15 would be awesome. Thanks again. What is the difference between the T12 GMC and the M3 GMC? The T12 was a short series of 86 vehicles. After that, the vehicle was standardized as the M3 GMC, with some slight modifications. Indeed, there seems to be some ambiguity in our article. It is fixed. I am trying to figure out what half-track my Uncle used in WWII. In early 1943, he was stationed on the eastern portion of England to provide assistance in trying to down the Luftwaffe as they bombed England. Then, he went ashore a couple of days after the invasion of Normandy. He continued fighting including the Battle of the Bulge.. While I know the specific model is impossible to tell, I would appreciate your “best guess” by letting me know which one was the probable model and its guns. I appreciate any help you can give me. Hey Randy, give us some more info. First off, what nationality was he? American or British? What unit was he in? Any other info you can share? I am scratch building a 1:14 model of an Sd.Ah.116 tank transporter trailer and would like to know a suitable US half track towing vehicle rather than the Famo that was used. Can anyone suggest one that could pull this 20+ ton monster? Nice Article on the 1/2 track. BUT! 386 ci doesn’t equate to 3660 cc. I’ve seen more than a few, both torn down and working, and believe me they are not 3.6 liter 6 cylinder’s. I can see 386 ci engine as the pistons are as larger as a 1 ib coffee can. Follow up comment; Inline 6 cylinders back then tended to be large slow speed HighTorque Engine’s. And they were usually an L-Head which wasn’t conduciveto high speed running. With a 6.3 to 1 comp ratio, the pistons pretty much have to be oversquare (wider than tall) and with a fairly long stroke. Which all necessitates a large slow speed engine With a Redline of about 3000rpm. 386CID or 6.32L(6332c.c.) makes sense. To those who read this request. on May 5th every year. partcipated during the 2 WW. who could give me a clue where I can buy these emblems.? many thanks for your valuable information. The photo labelled ‘M3 Half Track, Thunder over Michigan, 2006.’ appears to be an M2 half-track rather than an M3, judging by the short body length and ammo storage doors (where the US flag is painted). Per this site all (between 3000 to 4000) were taken out of service in 1999 and almost all scrapped. I’m writing an analysis of an older WWII game, and I came across a… quirk of it. Are there records of the British and Russians mass-modifying their lend-leased M3s with local-equivalent weapons? I know that the Russians did so with their Shermans when they were unsure about a steady supply of ammunition for the M3 75mm gun (creating the M4M variant), so that is why I ask. Well, it was certainly not difficult to change the machine-guns to other models if they didn’t have ammunition or anything else available. No other large-scale conversions were made to my knowledge. As for the M4M, I am extremely circumspect of such a conversion being made. There is little to no direct information on it except a quip from Zaloga’s Sherman book. Other similar projects (Matilda rearming for example) are quite well documented and photographed. Also, it seems there is little point to rearming the Sherman with the T-34’s gun.